You’d be surprised how many of these books are Bibles. If you grew up in a Christian context, you may have learned that the Jewish Bible is “the same as the Old Testament.” That’s not quite accurate. I want to be clear about one thing: when you are working with a scripture, anyone’s scripture, the safest thing is to use the version recognized for the community. So I recommend that anyone doing Christian study use the appropriate version of their Bible, and I recommend that anyone doing Jewish study use a Jewish Bible. ARRANGEMENT: The Jewish Bible is arranged into three parts: TORAH, NEVI’IM, and KETUVIM, meaning “Torah,” “Prophets” and “Writings.” Torah is the five familiar books of Moses. Nevi’im is the books of the Prophets, starting with Joshua and ending with the post-exilic prophets. Some of the books are named after prophets, some have names like “Kings.” “Writings” is everything else, including Psalms, Wisdom Literature, the 5 Scrolls, and Chronicles. This is to some extent a ranking according to the honor the tradition gives to the books. Christian Bibles are arranged quite differently. Because of this arrangement, one name for the Jewish Bible is Tanakh, a Hebrew acronym for Torah/Prophets/Writings. SOURCES: Jewish Bibles are based on the Masoretic Text of the Bible. Early Biblical texts lacked vowels and punctuation, just as the Torah scroll in a synagogue does today. The Masoretes were a group of Jewish scholars who added versification and vowels to the text between 500 and 900 CE. They examined the multiple versions of texts floating around in their time and put together a standard version of the text for the community. This is still the standard Jewish text, which is mostly in Hebrew; a few of the Writings contain a bit of Aramaic. Christian Bibles draw on a variety of sources: the Vulgate translation in Latin (405) by the Christian scholar Jerome, the Septuagint in Greek (200 BCE), as well as others. Notice that while these texts are older than the Masoretic text, they “pass through” a third language on their way to English. In the case of the Vulgate, that translation includes Jerome’s Christian interpretive filter. לָכֵן יִתֵּן אֲדֹנָי הוּא, לָכֶם–אוֹת: הִנֵּה הָעַלְמָה, הָרָה וְיֹלֶדֶת בֵּן, וְקָרָאת שְׁמוֹ, עִמָּנוּ אֵל. Granted, these are not huge differences, but you can see that it might color one’s interpretation of the book. Consider the considerable difference between Jewish and Christian notions of prophecy. Add to that Christianity’s doctrine of the virgin birth, alongside Judaism’s belief that the baby mentioned here is King Hezekiah. Notice, too, that “Emanu-El” or “God is With Us” was not a name given to either Jesus of Nazareth or to little Hezekiah by their respective youthful mothers! And this is just a single example – the translations are full of them. 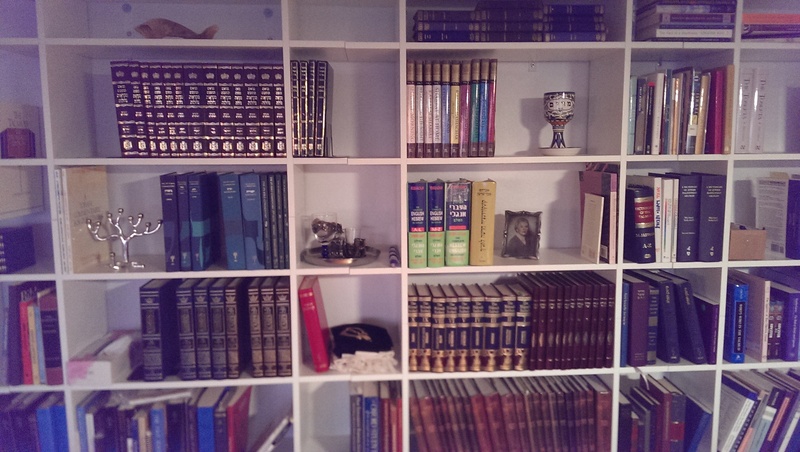 There are number of different Jewish Bibles on the market. The Jewish Publication Society’s 1985 translation is used in most American liberal congregations. At our shul’s bible study class we use the Jewish publication society Tanach, but we have a few readers who like to bring in the King James and the rabbi will sometimes ask for the alternate translation. The readings from the King James always seem to be more dramatic, so it adds spice. The KJV has the most beautiful English translation out there. For the most literal translation of the Hebrew (sacrificing beauty and sometimes comprehensibility) I like the Everett Fox translation of Torah. When I’m feeling curious about a word or phrase, I look at several different translations, because each one holds some part of the original. Sounds like a fun Torah study! Thank you for letting me know! I’m glad it is helpful. Hello! I’ve read the Tanakh in English for years and I’m trying to up my study by switching to Hebrew. I’m picking up some lexicons and grammars recommended by friends, but everyone pretty much just says to get a Hebrew Tanakh. But, from my Christian friends who read in Latin and Greek, I know that the translations can be very different and there are some varieties that are *undesirable* (One would never dream of using a Nova for study; the other won’t use the Stuttgart since it’s not Catholic-approved). As such, I was wondering what your recommendations are for the editions of Hebrew Tanakh you would recommend (and absolutely not recommend). Searching online, I’ve seen recommendations for the Biblia Hebraica Stuttgartensia and Quinta, Zondervan’s Reader, and Koren’s Ma’alot. But I simply don’t know enough about the different versions to say yes to one (or three). Previous Previous post: What’s an Aufruf? Next Next post: Welcome to Tammuz!